Stewart Regan, the Yorkshire chief executive, was forced to defend the club's new drainage system after the first one-day international between England and West Indies at Headingley was abandoned shortly after 3pm, following torrential morning rain left the newly relayed outfield saturated. Umpires Nigel Llong and Steve Davis conducted several pitch inspections but although the weather itself improved, the outfield remained drenched. Regan, however, insisted the system would be working perfectly come the Ashes. "We are all very disappointed with the outcome today," Regan said. "What you saw was a torrential downpour last night and another this morning and the water has that in the thatch of the grass and hasn't drained away quickly enough. "We are confident it will be able to handle major downpours, that's why we are investing in it and as it continues to bed in then of course it will improve. This is not about blaming but about trying to understand what has happened and recognising that this drainage system will improve and get better." Rain had fallen overnight and hammered down again at about 9.30am for two hours, then just as the groundstaff had started to remove the covers, another burst swept over the ground. Puddles began forming on the outfield and some areas around the boundary resembled a swamp. By late afternoon the sun was shining, but the outfield remained unplayable. Those that remained from an 11,000-strong crowd made their frustrations known, but the England players did their part when they went out to sign autographs (as they did in Antigua when that Test was abandoned in February). However, the whole day raised serious questions about the timing of Yorkshire's project to relay the outfield and hosting an international just seven weeks after completion. The club spent a £600,000 ECB grant on the new drainage over the winter, but the outfield hasn't yet had a chance to properly bed down so that it can work at its optimum level. 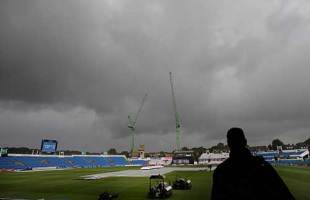 High standards are expected these days after the success of the Lord's version which allows play very quickly even after torrential rain, such as occurred in the first Test against India in 2007. The project fell behind schedule and the turf was only laid at the beginning of April when the club had hoped to complete the work by March. "This sort of project doesn't happen overnight, it takes time for it to bed in and we are all disappointed with how we have ended up," Regan said. The delay in completing the work meant that the groundstaff haven't been able to aerate the outfield and allow it to drain fully due to the risk of damaging the turf. The outfield was signed off by the ECB on April 30, mid-way through the Championship match against Worcestershire which was also hit by the weather, and Regan insisted that the ground had been ready to host an international and rejected calls that it should have been moved to another venue. "As of last night the weather was perfect, the outfield had been signed off and the forecast was good," he said. "We were all happy with it and the ECB were happy with, we have just had some very unusual circumstances. We are very disappointed for the public and nobody likes upsetting spectators, but you can't legislate for the rain. We live in a country that gets more than most. "We've played three major [county] matches here and they played perfectly well. The umpires were delighted and the pitch inspector from the ECB was delighted. I think the key issue here is that there were two torrential downpours and the water couldn't drain away quick enough." The ECB has given six counties the grants towards providing new drainage facilities in order that as much playing time as possible is saved, but that doesn't mean that counties aren't allowed to put extra funding in themselves. The club are spending £21million on a new pavilion at the Kirkstall Lane End which is largely funded by Leeds Metropolitan University, but that is also behind schedule and the ground will resemble a building site for the Ashes. It was due to be completed for the fourth Test in August, but now won't be completed until 2010, while £500,000 has also been spent on a new replay screen. However, Regan said there wasn't any more money to invest in a more advanced drainage system. "It's very easy to say spend [an extra] £400,000, but that money simply doesn't exist," he said. "The £600,000 is deemed sufficient to put in a drainage system capable of doing the job and that's what we've got. What we have here are unusual circumstances and torrential rain and any ground would have struggled to cope, apart from Lord's." This abandoned match means two of the Ashes venues have had serious issues with their playing surface recently. Last week, Glamorgan were docked points following a Friends Provident tie against Essex, after the Cardiff pitch was rated 'poor' for taking excessive turn.